Faith Presbyterian Church offers a variety of music styles at both worship services to give praise to God. We welcome all musicians and music lovers to be part of our ministry. If you are interested in participating in our music ministry, contact Music Director Mark Tootle at mtootle@faithpresby.org. 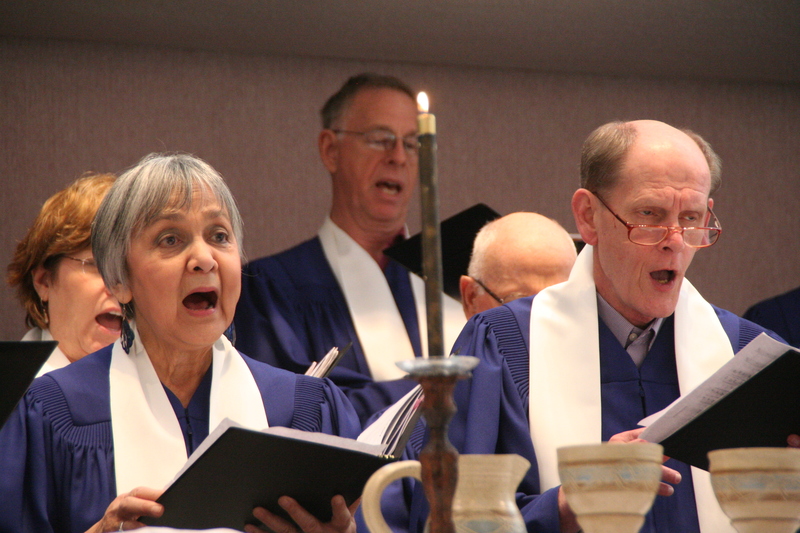 The Chancel Choir provides an inspiring, energetic and Spirit-filled music ministry and sings regularly at both services. Rehearsal is held every Thursday from 7:00 to 8:30 p.m. from September through May. Those interested in joining the choir should be enthusiastic, patient, and willing to commit to a team concept. All vocal abilities are welcome! If you have musical talent — including singing or playing guitar, piano, drums, or other instruments – and a desire to help our congregation worship through song, check out Faith’s Worship Band. We sing and play contemporary praise music every Sunday. Rehearsal is on Wednesday evenings from September to May and on Thursday evenings in summer. Do you have experience playing a musical instrument? God has blessed Faith’s music ministry by providing many instrumentalists from our congregation who play alongside our choir or accompany the congregation as we sing. Our music is varied: the Chancel Choir sings everything from Bach to bluegrass, the Worship Band uses keyboard, drums and guitars to lead us in the latest praises, and our Faith Brass Ensemble supports the congregation singing new and traditional hymns. Instrumentalists are invited to be a part of these diverse musical offerings.